The calm of Q3 was interrupted by severe volatility starting in the first few days of October and continuing through to this writing. Last quarter, we wrote that the yield curve was sending a pessimistic signal about the state of the economy over the next 18 months. However, we don’t necessarily believe the recent volatility is directly related to the state of the yield curve; to the contrary, the yield curve has actually steepened a bit since our last communication. Rather, what we are seeing appears to be a reaction to tighter financial conditions (continued interest rate hikes by the Federal Reserve) and heightened concerns about the impact of US-China trade tensions. While these features have been present for some time now, in the context of stretched asset valuations, it simply takes less bad news trigger this sort of volatility. This backdrop of heightened asset valuations will continue to drive volatility in the medium term, despite the current relatively healthy US economy and subdued inflation. When the Federal Reserve increases interest rates, it has the effect of tightening financial conditions and reducing liquidity in the market. The market is currently pricing in about three more rate hikes over the next 12 months. The result of this is that higher yields on short-term bonds create more competition for capital. This in turn contributes to falling equity prices as money flows from equities into now higher-yielding bonds. 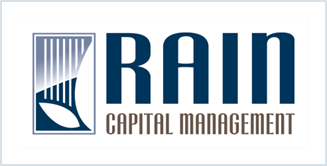 At Rain Capital, we were early in this process, moving into higher-yielding short-term treasuries in early August. After the Fed’s hike in late September and a hawkish message by Fed Chairman Jerome Powell on October 3, the broader market followed suit. In essence, investors are in the process of reevaluating their return expectations across asset classes given the environment of higher interest rates and greater economic uncertainty. Part of the economic uncertainty that has gripped markets recently has been driven by an escalation of the US-China trade conflict. Rather than making concessions to placate President Trump’s initial volley of tariffs, China has responded in kind with its own tariffs. A number of larger, global companies have reported earnings already and have cited trade concerns as a potential impediment to sustained growth and their earnings outlook. The frictions are also adversely impacting growth in China, forcing the central bank to announce its fourth rate cut this year. The most recent round of trade negotiations between the US and China ended without any progress in Beijing. While some believe that stalled trade negotiations are just posturing ahead of November midterm elections and that trade talks will become more constructive once the elections are behind us, we are more skeptical. We see the negotiation in the context of a generally more assertive China that seems intent on countering US economic and military power in Asia and around the world. And, while Trump may need to appear tough on trade ahead of mid-terms, he also has the 2020 national election in his sights and may not be as likely to capitulate to China’s demands at this point either. So, for political reasons, trade protectionism may be with us for the foreseeable future. The impetus for higher interest rates in the US and, to a lesser extent, for the US’s perceived negotiating strength versus trade partners, is the solid state of the US economy. Unemployment is very low, the US consumer is strong, inflation remains subdued and corporate earnings, with a few exceptions, are solid (despite some high profile earnings misses like Google and Amazon, 80% of S&P 500 companies have reported a positive earnings-per-share surprise, while earnings growth for the S&P 500 is at nearly 20%, the highest since early 2011). We expect this strength to support higher inflation expectations and an increasingly aggressive Federal Reserve in the coming months. Unless asset valuations improve – either though even stronger earnings growth or lower asset prices – this dynamic will continue to drive equity market volatility for the foreseeable future. In the simplest terms, high asset values make for skittish investors. However, in the absence of the severe imbalances that have led to previous market crises, we view the current jitters as more likely a normal pocket of volatility, rather than the start of a full-blown bear market.